When someone invites you to a 90’s themed costume party, what do you immediately think of? Grunge? Clueless? Zenon girl of the 21st century? All great options. 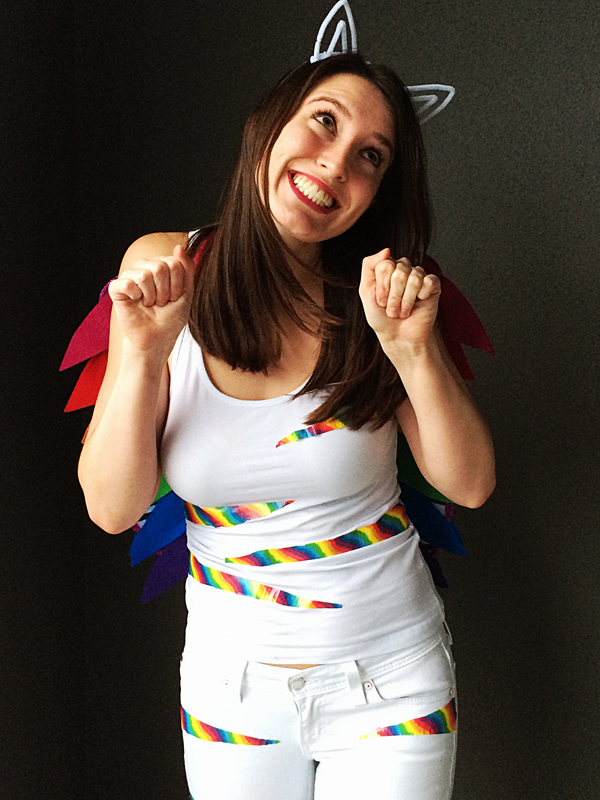 But really, how often do you get the opportunity to wear a rainbow animal angel costume? Time to take advantage of this opportunity while you can! 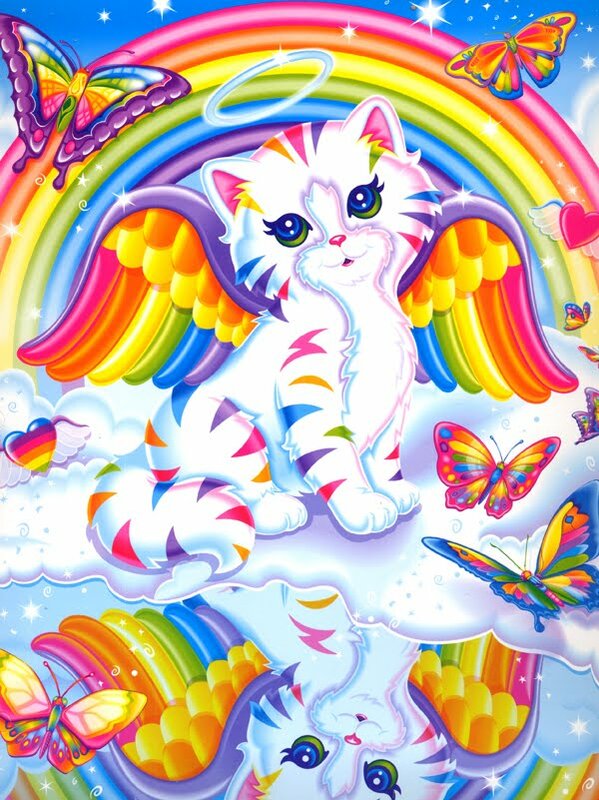 Lisa Frank encompassed what it really meant to be too cool for school in the 90’s. If you had notebooks with rainbow unicorns or folders with colorful leopards, you bet you would have people begging you to sit at their table for lunch. Distracting? Yes. Confusing concept? Also yes. Lisa, smart move knowing girls love color, glitter, and cute animals. 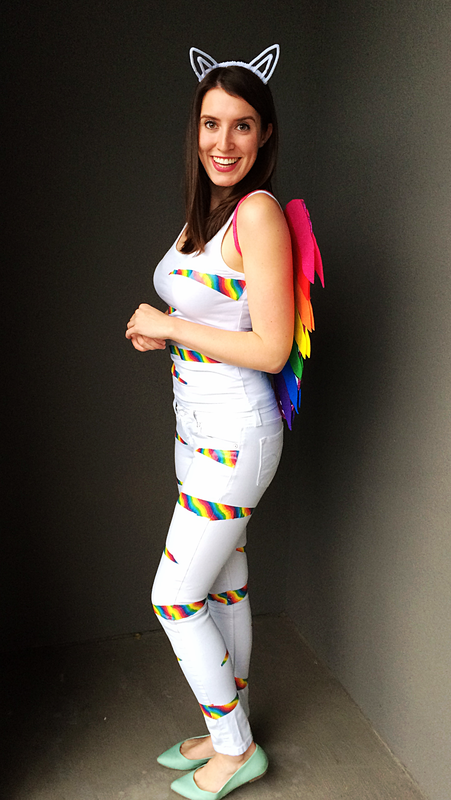 Though I didn’t remember the rainbow kitten outright, when I stumbled upon her, I knew I could make that work as a costume. Mind you, this was two days before the party. 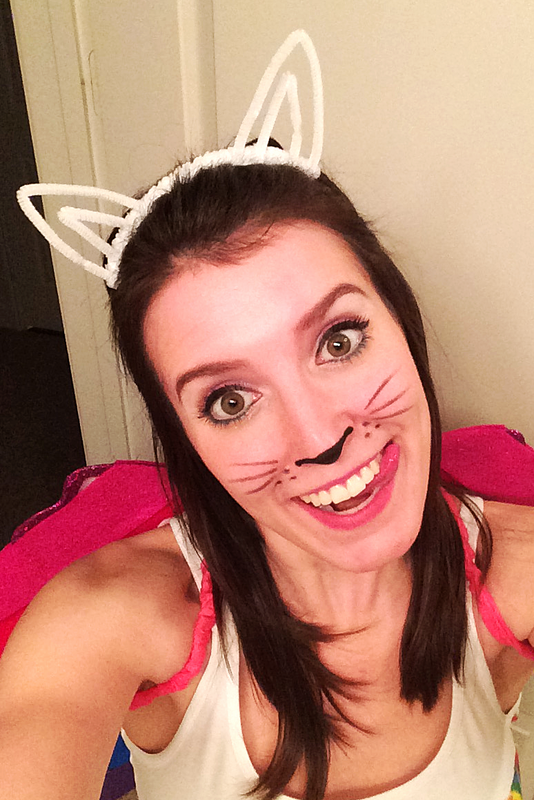 Thankfully, it was shockingly easy, and cheap (under $15), to put this costume together. Check my list of supplies and the full DIY below for how to attain this ridiculous look! To create a striped kitten bodice, cut strips of rainbow duct tape about 6-8 inches long. 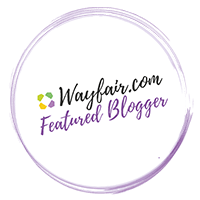 Cut the tape into two triangular pieces and place one on the front of your leg starting at the seam of your pants and one on the same seam wrapping to the back of your leg. Repeat, lining up the tape on alternating inner and outer seams of your legs. Complete the same process on your tank top with strips about 12 inches long. 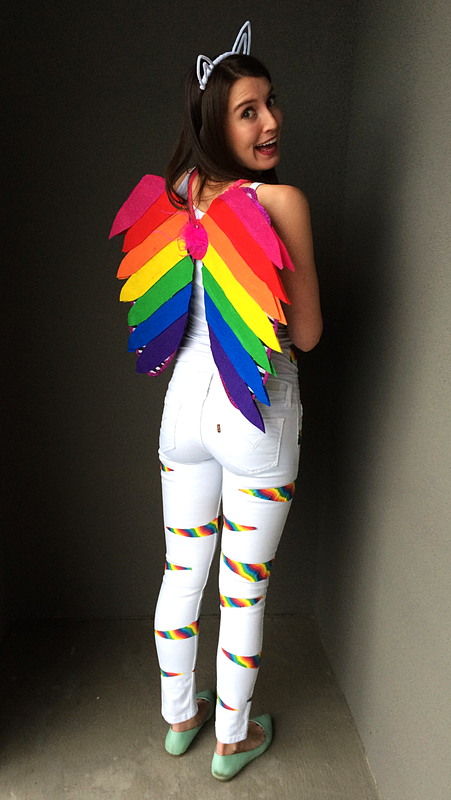 To create the rainbow wings, take your felt and cut each piece into four long strips length wise. Cut each piece on one end to have a rounded point, similar to the shape of a feather. 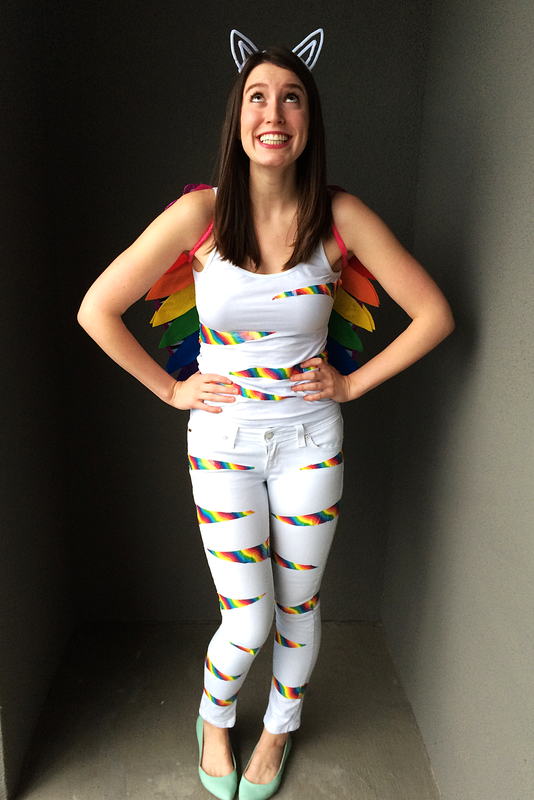 Lay one strip of each color in rainbow order from the top of one wing to the bottom, making sure they all cover the entire wing. Once you have them laid out, hot glue them down. Cut around the blunt ends of the feathers to match the shape of the wing. Repeat this process on the other wing, and then on the back sides of each of the wings. NOTE: If you use butterfly wings, you will want to wear them upside down in order to make them look like an angel. I bought butterfly wings because they were a bit cheaper. To create the cat ears, use two pipe cleaners to create the main sections of the ears. Fold them in half and wrap the ends around the headband. Cut one more pipe cleaner in half and repeat for the inner portion of the ear. Wrap another pipe cleaner around the headband to add more white if desired. 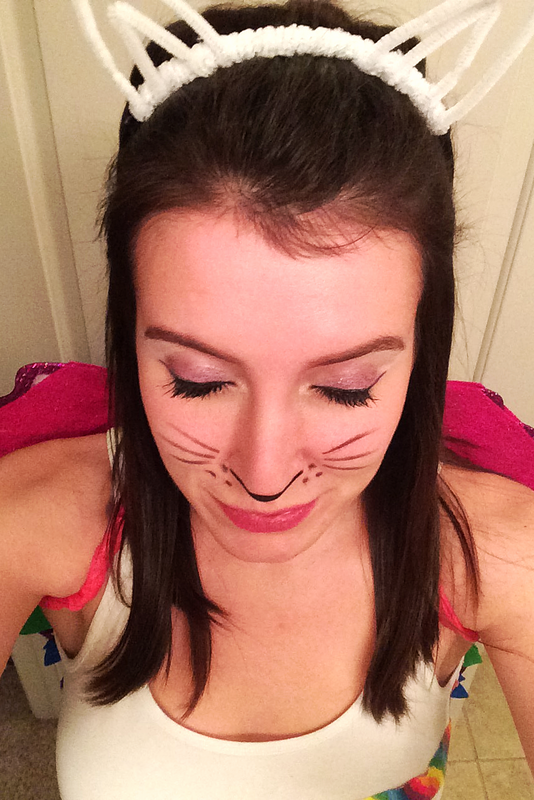 Later in the night I also added a cat nose and whiskers with black eyeliner to the look, along with some glitter. Ok, a lot of glitter. Also, sorry for the ridiculous selfies!